Chelsea Ladies forward Fran Kirby has won the women’s Player of the Year award. Kirby,24, has been an inspiration for the swashbuckling Blues this year, and has netted 22 goals in all competitions so far this term to help the west Londoners run amok. 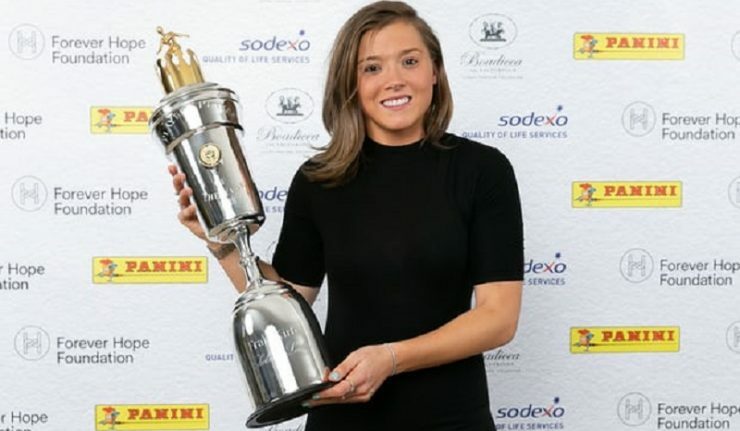 Kirby was one of five players from unbeaten Women’s Super League leaders Chelsea to be shortlisted for the award, with Millie Bright, Ji So-yun, Maren Mjelde and Ramona Bachmann joining her and Manchester City’s Jill Scott. “It’s pretty special for me,” the former Reading striker said at Sunday night’s ceremony at the Grosvenor House in central London. “It’s very humbling because it’s voted for by the people I play against week in, week out, so I’m absolutely delighted to win. She continued: “In every game that I play in, I try to do something that I’ll remember after the game. 0 Response to "Chelsea’s Fran Kirby Named PFA Women’s Player Of The Year"